David Bowie 1972-05-06 London ,Kingston Polytechnic (Diedrich). The JSD Band attended to The Part Of The Programme Leading up to Bowie and his men’s appearance . ”I’M David Bowie,These coult be the Spiders from Mars ,but this is some our music” Bowie says ,coming on stage.The audience are fairly calm and there spells of silince in between the numbers. The majority of the audience knew little or nothing of Bowie ,but ,when Space Oddity begins , they recognise it and start applauding. 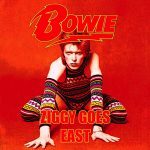 During the lift-off they must laugh: for Bowie tries to imitate with his mouth the sound of a rocket taking off ,but all he produces is some muttering! The performace of the song Space Oddity is beautyful with Mike Ronson taking the second voice .’Thank you very much for coming . I want to say that I don’t think we’ve ever worked with a better group .I think the JSD Band are fantasic, I really do. this is a song by a French composer” ,Bowie says, and continues with Amsterdam. Then comes I Feel Free ,the old Crean number written by Keith Brown. I dare say the lengthy intrumental part played in this song sounds very much like that of Width Of A Circle ! 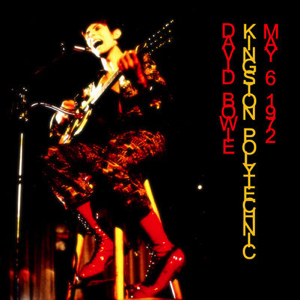 The audience clap along with the first part of the song ,and when it is finished Bowie introduces The Spiders to the audiece . After Moonage Daydream comes White Light,White Heat ,which Bowie announces with the words: “We shall continue with a number by somebody I admire very much ,an American songwriter called Lou Reed”. “Thank you this is one from the album we’ve been doing most of the material tonight ,it’s called Ziggy Stardust and the Spiders From Mars ,and this is called Rock & Roll Suicide” Bowie says when he is called back by the enthused audience. “show me your hands!” he sings ,and afther this the audience are even more frantic ,and clapping their hands ,yelling ,and stamping their feet ,they finally succeed in calling Bowie back a second time. “When his banjo we’ll do one more for you tonight. It’s a Lou Reed number called Waiting For The Man .. The early 1972 Spiders shows tended to be wilder and more energetic than the 1973 shows. The costume changes, lighting cues and choreographed moves of the 1973 shows rather compromised spontaneity. Kingston Poly was a very spontaneous physical performance. If you can get hold of the tiny bit of footage from Aylesbury Friars in 1972 you’ll see what I mean. There was an absolutely deranged young woman in the audience. She had short blonde hair and I think, if memory serves me well, was wearing hot pants. It was of course Angie Bowie. She was wild! At one point she was raised aloft on someone’s lucky shoulders and goading David and the band to even greater heights. I’m pretty sure that at one point David leapt into the audience to join her. During Suffragette City maybe? It was a long time ago… Angie had been a student at Kingston Polytechnic apparently and this was a special gig for her. Mick Ronson set his Gold Les Paul to maximum feedback and passed it into the audience too. Probably during Moonage Daydream but I can’t be sure. As I say, a wild show. Setlist was pretty standard except for the inclusion of Get A Job and maybe Song For Bob Dylan. Might be wrong about the second one though.